The following book series is free to read online. I hope you benefit from them and will buy the off-line versions. The entire book series can be downloaded from Leanpub. Understanding security well enough and being able to shift it left into your development team without adverse side effects is hard. 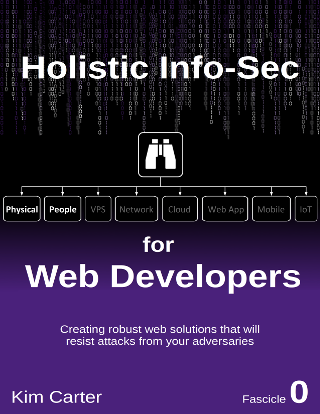 “Holistic Info-Sec for Web Developers - Fascicle 0” teaches you everything you need to know to build a security focus and knowledge into your development team(s). The book series is useful as both a tutorial and reference book.